Robin Geiß, Andreas Zimmermann, & Stefanie Haumer (eds. ), Humanizing the Laws of War: The Red Cross and the Development of International Humanitarian Law (Cambridge University Press, 2017). 278 p. Hardcover $110.00. Humanizing the Laws of War is an edited book born from a 150-year celebration of the International Red Cross and Red Crescent Movement in 2013. “The International Red Cross and Red Crescent Movement at 150: Developing and Clarifying International Humanitarian Law,” honored the movement by pulling together international humanitarian law (IHL) scholars and practitioners for a meeting in Berlin. The meeting led to this work memorializing the achievements of the International Committee of the Red Cross (ICRC) and its undeniable impact on IHL during the past 150 years, while also addressing the organization’s shortcomings and outside criticism. The editors open the book with an introduction focusing on the interaction between the ICRC and the National Red Cross or Red Crescent Society within countries. They note the cognizable advantage to this structure with locals who know and understand the country being able to most effectively implement broader initiatives on the local level. However, the authors note the need for increased cooperation between the organizations to further the worldwide influence of IHL. Part I discusses the ICRC’s influence on treaty making. In Chapter 1, Robert Heinsch gives an historical account of the development of the Geneva Conventions showing the ICRC’s intimate involvement in drafting the conventions, and thus framing the conversation, noting “[i]t is probably not exaggerated to say that there is no other field of international law in which a non-State entity has had such an impact on the norm-development process as well as on the dynamic interpretation of the respective rules.” (p. 27). Heinsch notes the ICRC has also authored commentaries on the Geneva Conventions and is currently updating those commentaries, further demonstrating the ICRC’s influence as a central authority on interpretation of the conventions. The second chapter furthers the discussion with Michael Bothe detailing the ICRC’s influence on the subsequent protocols to the Geneva Conventions of 1949 while acknowledging the protocols’ shortcomings, notably in nuclear and environmental fields. Part II looks beyond treaties at the ICRC’s influence on IHL norm development. In Chapter 3, one of the editors of the 2005 Customary International Humanitarian Law study, Jean-Marie Henckaerts, describes the origin and addresses criticism of the study that laid out 161 rules of customary IHL, and is continually updated through additions of relevant state practice in the ICRC’s Customary IHL database. The origin story provides valuable context for understanding this expansive study and I appreciated the author’s direct discussion of criticism since the study’s publication. Chapter 4 similarly provides background and addresses critiques of the ICRC’s Interpretive Guidance on the Notion of Direct Participation in Hostilities under International Humanitarian Law. Robert Cryer discusses the criticisms, but pushes back noting if the critical governments “wish to reject the ICRC’s view, the impetus is now for them to show that they can create (and get broad agreement thereupon) something better.” (p. 138). Part III turns to the ICRC’s influence on weapons laws and international criminal law (ICL). Chapter 5 discusses the ICRC’s efforts in developing IHL norms and treaties on weapons that are by their nature indiscriminate or cause superfluous injury, such as chemical weapons and cluster munitions. Kathleen Lawand and Isabel Robinson share examples of the ICRC successfully serving as a catalyst for creating weapon-specific laws, but admits the ICRC has not been successful in all circumstances, particularly in the case of nuclear weapons. In Chapter 6, Carsten Stahn discusses the intersections of IHL and ICL, focusing in particular on interaction between the ICRC and international criminal courts and tribunals. Stahn shares how IHL and ICL are not mutually exclusive and further understanding of and development of their relationship could improve both fields. Part IV, the conclusion, is authored by two of the editors, Robin Geiß and Andreas Zimmermann. They highlight the ICRC’s successes and prominence within IHL while also grappling with its failures. In particular, the authors note the need for a compliance mechanism or other means to increase IHL compliance and discuss barriers impeding compliance initiatives. This review provides just a glimpse at the fascinating history of the ICRC discussed in the work. The book’s critical lens makes for an enlightening read allowing the reader to gain a broad understanding of the ICRC’s contributions to IHL laws and resources, and the current limitations of IHL and the ICRC. The heavily footnoted chapters allow readers interested in any of the topics covered to look deeper into history or criticism of the ICRC’s influence and IHL. This book would fit well in any library with an IHL collection. Konrad Buczkowski, et. al. Criminality and Criminal Justice in Contemporary Poland: Sociopolitical Perspectives (Ashgate Publishing, 2015). 208 p. Hardcover $112.46. Criminality and Criminal Justice in Contemporary Poland is a collection of articles by professors, as well as one alumna, of the Institute for Law Studies at the Polish Academy of Sciences. The series of ten articles designated as chapters describe the philosophical views on crime and criminality of some of the authors, as well as other Polish authorities on the subject, and describe the historical and contemporary aspects of crime, the criminal justice system, and public perceptions of both in the country. Poland is a country of significance to international and comparative legal scholars in being one of the largest countries in Central Europe, a region of nations characterized by long legacies of foreign rule, the more recent experience of a half-century of existence under Soviet-imposed Communism, and a still unfolding path of economic and political integration into pan-European institutions. As such, this work is of relevance not only to those interested in comparative criminal law, but also those interested in criminality across time and cultures, as well as the economic, social, political and cultural issues that arise in societies in transition from command to market economies and from authoritarian to liberal-democratic political systems. Chapter 1, “Criminality Today and Tomorrow,” discusses historical and philosophical definitions of the concept of crime, as well as the ways in which crime is defined in the current Polish criminal code, with reference to defenses and mitigating circumstances (e.g., when certain acts are committed by juveniles or in self-defense), contained in the code. Chapter 2, “The Status of Criminality in Poland since 1918”, narrates the history of Polish criminal legislation from independence through the communist era, to the present day, as well as describing rises and falls, and changed in criminal activity in the country with reference to available statistics, chiefly, the total number reported crimes and finalized convictions in a given period. Chapter 3, “Social Change and Criminality: Mutual Relationships, Determinants, and Implications” treats the issue of social change and its effect on the level and nature of criminality. Kossowska describes the findings and conclusions of a number of criminologists concerning changes in criminal activity during several key periods of transition in 20th century Polish history, concluding with a discussion of the precipitous drop in ordinary criminal activity in many nations including in Poland, albeit delayed in comparison to elsewhere, and also with the advent of cybercrime and the unusual, un-marginalized nature of those who engage in it. Chapter 4 examines the association between crime on one hand and socially excluded and economically marginalized groups on the other. Beginning with a discussion of the criminalization of the itinerant and unemployed in medieval Europe, the author examines how poverty and factors often accompanying poverty, such as feelings of alienation from society, alcoholism, family breakdown, living in marginalized areas often combine with opportunities to commit crime, leaving underprivileged people to be disproportionate perpetrators and victims of crime. Chapter 5 continues by examining the difficulties faced by and failures of the Polish social welfare and public educational system in being able to effectively reduce social exclusion, and, by extension, criminal activity. Chapter 6, “Justice and its Many Faces,” describes the views of many contemporary Polish writers on society’s proper response to those guilty of committing crimes. Chapter 7 “Controlling Criminality” focuses on the Polish criminal justice system’s historical approaches to combating crime, with statistical data on numbers of crimes, convictions, and frequency with which various sanctions were imposed. Chapter 8 “Supervised Liberty,” focuses on one of the most frequently imposed of these sanctions, the suspended sentence, and comparing the philosophical justifications and practical success of this sanction with that of probation in the United States, United Kingdom, and similar systems elsewhere in Europe. Chapters 9 “The Social Perception of Criminality,” and Chapter 10 “Criminality and the Media” combine to tell the story of public perception of crime and the role of the media in forming that perception, beginning with the late Communist era, typified by press censorship, and a relatively low level of certain criminal activity, and continuing on through the transition to democracy, characterized by a rise in criminal activity as well as the development of sensationalist media and a great rise in popular fear of crime. The story of a tabloid press fanning public fear of crime, as well as the sentiment of a criminal justice system that is ‘soft on crime’ despite its many punitive aspects would likely ring familiar to the ears of many American readers. Many of the chapters of the book are written in a somewhat dense scholarly style. Citations are in APA format. The reader should note that citations to many of the graphical figures provided in the work are not provided with the figure, but rather are indicated within the text, where the particular figure is first mentioned. Sometimes chapters focus on providing numerous summaries of the opinions and findings of various other authors rather than rigorously promoting and supporting the authors own thesis. The strength of these chapters, however, lie in providing a reader a good outline of Polish scholarship on crime and penology, and for this reason the book would fit well in an academic law library’s criminal law or comparative law collection. The Dictionary of the Civil Code, an English translation of more than 1600 entries selected from the Vocabulaire Juridique of Gérard Cornu under the auspices of the Association Henri Capitant des amis de la culture juridique française, introduces to readers, jurists or not, the essential concepts of the French Civil Code. 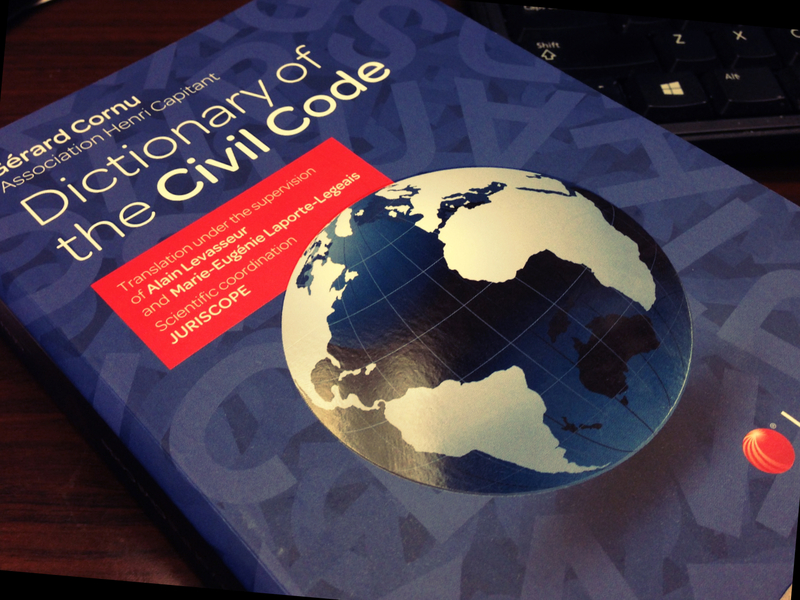 Key to an understanding of the civil law through its terminology as translated and explained in English, the definitions are enriched with references made to the Civil Code of Louisiana. This work of reference on the French legal and civil law culture is an essential tool for comparatists, civilians, jurilinguists and translators. The dictionary translates over 1600 entries selected from the French language Vocabulaire. Each entry provides the French term, with a definition in English. Levasseur and his translation team have supplemented the original definitions with references to the Louisiana Civil Code. These added references are intended to illustrate the possibility of expressing civil law concepts in English without resorting to the terminology of the common law, as well as to be a useful resource for researchers of Louisiana civil law. Aiming to capture the unique language and nuance of the civil law, Levasseur includes both recommended English equivalents for each term, as well as English terms to avoid. The book also contains an index that allows the researcher use a known English language term to locate the appropriate French equivalent in the definitions section of the book. Professor Levasseur spoke about the project in April at a symposium entitled The Louisiana Civil Code Translation Project: Enhancing Visibility and Promoting the Civil Law in English, held on the LSU Law Center campus in Baton Rouge, Louisiana. Highlights from the symposium can be found in an earlier DipLawMatic Dialogues post.